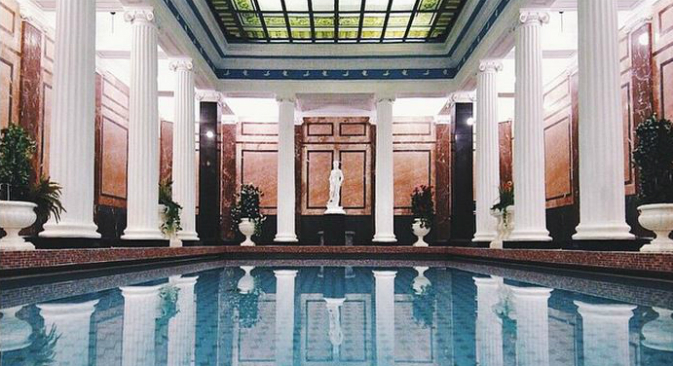 Members of the Instagram photo-sharing social network have been invited to document the magnificent interior of Moscow’s Sanduny bathhouse after hours as the latest initiative of the #empty movement. The Sanduny administration invited the amateur photographers to capture the legendary baths once visited by Tolstoy, Chekhov and Chaliapin. Sanduny is a historic bathhouse, which has preserved its magnificent interiors from the 19th century. The Sandunovskiye Baths are located in the center of Moscow, just a five-minute walk from Red Square. The baths are considered an architectural and engineering wonder, and recently they received official recognition from the Cultural Department of Moscow and were taken under government protection as a unique cultural heritage site. Moscow’s famous Sanduny bathhouse has invited members of popular internet photo-sharing social network Instagram to photograph the empty baths from unique viewpoints as part of the #emptysanduny initiative, the latest in a series of projects to photograph the interiors of well-known buildings outside opening hours. The trip to Sanduny in December changed the idea that young photographers had about the Russian bathhouse. "Before this I had been to the baths just once," says Alexandra Pankratova, organizer of the Instagram flash mob (@pankratova916). "It was a small house near my dacha, with a wooden interior. It was very modest and cozy. That is the picture that would come to mind when I heard the word ‘bath’." But the trip to the Sanduny changed all that." I had always thought that the Russian bath was a small facility with wooden paneling inside, with birch besoms and small pails for the water. I had never thought that a bath could have such an interesting interior. The interior of each facility of the Sanduny Baths has its own unique style. Large staircases, fascinating tile designs on the floor and on the ceiling, a gothic hall. Everything was so unusual and amazing that it completely changed my idea of Russian bathhouses. This is a real palace with enormous beautiful halls, high vaulted ceilings, marble staircases and painted gold. The administrator showed us the halls where bathers relax and take in the steam. He told us all the interesting stories about the films that had been shot there and how long the line is to get inside for New Year's Eve. To be honest, the sumptuousness and history of the baths are striking. Pushkin, Tolstoy, and Chekhov, who lived nearby, used to come here, and legendary opera singer Feodor Chaliapin said that the baths were good for his vocal chords. The Empty movement was created in New York by Instagrammer Dave Krugman (@dave.krugman), who invited several Instagram users to a private reception at the Metropolitan Museum of Art in New York outside opening hours, when nobody is in the museum. After the reception the participants posted photographs with the #emptymet hashtag on Instagram. Besides the Metropolitan, the Copenhagen State Museum of Art and the Royal Opera House in London have also made use of the initiative. Recently the Russian Instagram community has also joined the #empty project. In 2014 the Bolshoi Theater (#EmptyBolshoi), the Tretyakov Gallery (#EmptyTretyakov) in Moscow and the Hermitage State Museum (#EmptyHermitage) in St. Petersburg opened their doors to Instagrammers.